LG's range of "looks expensive but isn't" Optimus L Series of smartphones was something of a success last year, shipping 10 million units worldwide. 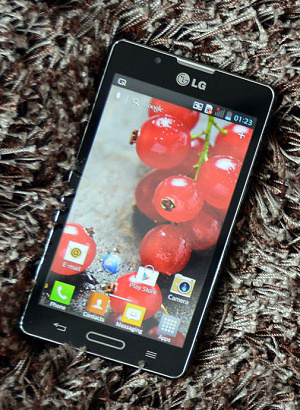 Time marches on however, so LG have refreshed the range with the LG Optimus L Series II. Three phones have been announced, starting with the release of the LG Optimus L7 II which has a 4.3" 480 x 800 pixel display, an 8 megapixel primary camera plus a 0.3 megapixel secondary one, a 1GHz CPU with 768MB of RAM, 4GB of onboard storage plus a microSD slot, a large 2460 mAh battery and all the usual features you'd expect from an Android 4.1 smartphone. The L7 II will be available in dual-SIM form in Russia this week, we don't know about other regions yet, however it does seem that there will be single-SIM and dual-SIM variants. We don't know how much the L7 will cost, but we would expect it to be in the €200 to €250 region. Also in the range is the LG Optimus L5 II with a 4.0" 480 x 800 pixel display and 1700 mAh battery, and the LG Optimus L3 II with a 3.2" 320 x 240 pixel panel and a 1540 mAh battery. More details of these will be announced at a later date. LG say that these new handsets feature "Seamless Layout, Laser Cut Contour, Radiant Rear Design and Smart LED Lighting", although at first glance they look a bit dull. Perhaps they are the sort of devices that look better in your hand than in a photograph. There are a bunch of LG software enhancements on top, but because these are Android 4.1 devices then you can download thousands of apps and widgets to make your phone your own. As long as LG can keep the price of these handsets down, then they should be able to shift quite a lot of these to customers with a modest amount of cash who want something that looks nice. Copyright (c) 2014 - Unauthorised copying is prohibited by law. Use of this site means that you agree to our privacy and cookie policies.